Dear Guests, you’ll find the best value ski pass prices, tariff for your ride by Dachstein Krippenstein cable car as well as the prices for the combi-tickets Yeti-ticket and Rumplercard for the Freesports Arena Dachstein Krippenstein here. The comeback of the Yeti-Ticket! At a favourable price you get great value journeys up and down the mountain at all three stages and snow-shoe hire at Dachsteinsport Janu. 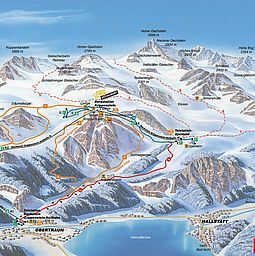 A tourer's ticket (Rumplercard) includes the trip up the mountain with the first and second sections of the Dachstein Krippenstein cable car/Obertraun, and also a trip up to the Dachstein Glacier with the Mitterstein double chairlift and the Schladminger Glacier lift. Prices in euros, including 10% VAT! Subject to price changes due to possible VAT raises. Family pass for use within the same family. When families purchase a ski pass for the two oldest children and at least 1 parent, the third and every additional child receives a free ski pass for the same duration Family proof required (children = D.O.B. 2003-2012)! 1.5 and. 2.5 day ticket: Afternoon + 1 or 2-day ski ticket, or 1 or 2-day ski ticket + morning. For passes which are for more 2 days a photo is required. Dog: Dogs are required to wear a muzzle and use of dog leashes. Tariff per dog: EUR 6.50. Deposit for the Keycard: € 2.00.